Moira Young started on an uphill battle, since I'm not a fan of novels written in a vernacular -- especially fantasy novels, which I admit I thought this was when I began it. I assume when reading fantasy that the characters speak in their language which has been "translated" into Standard English, so a vernacular seems rather disingenuous. Unless, of course, the characters later meet a group who speak "proper language X" in comparison. All of this to say that when I started this book, which I really wanted to review for the sake of a friend, it was with trepidation. One thing Young does that mitigated my worry was that she did not write the vernacular like she had cut out a pile of apostrophes and sprinkled them over the page. Sitting becomes not sittin' but just sittin, which really helped the flow of the narrator's voice. But what got me on board was when the narrator, Saba, counts the seconds between lightening and thunder by muttering "One Missus Ippi, Two Missus Ippi." A couple pages later she packs up a "red gizmo knife" which confirmed my new suspicions and Saba's voice carried me easily along for the next five hundred pages. 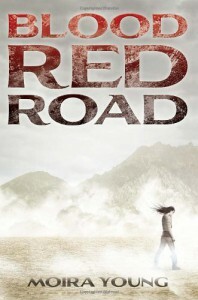 Blood Red Road is well-paced, but at the same time, the plot seemed more than a little disjointed. It's a classic quest plot: Saba must rescue her kidnapped twin brother, and gathers enemies, friends and an even larger goal along the way. There are a few dropped threads and a couple odd digressions that don't circle back into the plot, but that's not unexpected in a first novel. I think part of my feeling is due to my personal taste in dystopian or post-apocalyptic fiction. For me, such books are only as strong as the governments they portray. While Young has some very interesting ideas, I don't feel she gave us enough of the villain's backstory. If I had known more about how the King came to power, I might have been more frightened of him. The King also seemed to want power for power's sake, which is believable, but not as compelling as a villain who started out with good intentions and was corrupted by the very society he established. Lastly, I have to comment about the title. It's a strong, compelling title and I think will make lost of readers interested. 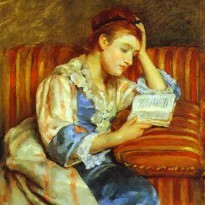 Having read the book, however, I don't really understand what connects it to the story. The best titles gather more meanings as their books are read, but this title seemed to shed them. All those negatives aside, Blood Read Road is an excellent first novel with a simply fantastic narrative voice (which would not be as strong without the vernacular). I think it would really appeal to fans of Suzanne Collins' The Hunger Games. I look forward to reading the other two in the planned trilogy, as I'm curious to see if Young will give us more of her world's history, which I'm very interested in finding out.